Calling all art lovers to one of the most exceptional Garden Route destinations, the Wilderness Art Festival is all about embracing the freedom of expression through various forms of art. 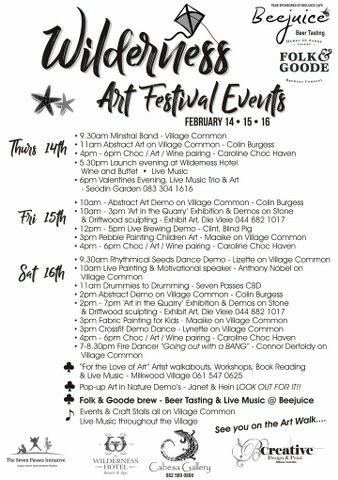 Taking place over three summer days in February from the 14th – 16th in the suburb of Wilderness, those attending will be transported and uplifted through works of art created by passionate local artists. 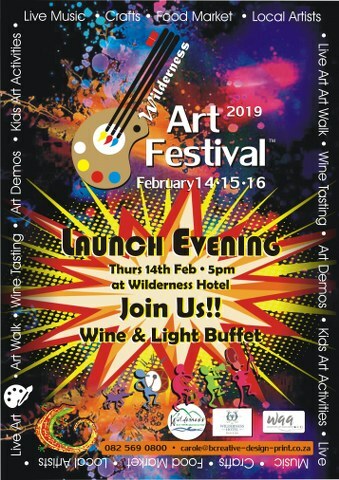 The motivation that has inspired the Wilderness Art Festival is largely thanks to the Wilderness Art Association’s approval to hold a captivating Art Walk over the three days of the event, beginning in Village Common and aiming to involve the entire Wilderness Business Centre. The goal of this family-friendly event is “to publicize the integrity of our work”. The main attraction during the festival will be the original artwork; however the art walk itself will put on display the natural beauty of this suburb, as well as the many popular tourist activities located in Wilderness, from beautiful gardens to coastal restaurants and attractions. The Art Walk will begin in Village Common, passing The Wilderness Hotel commence along George Road, through Leila’s Lane, down Beacon road to Milkwood Village and heading down Waterside Road, and a beach walk from Beejuice that ends at the popular Salinas restaurant. Art will be on display at various points in the Wilderness CBD as families and friends enjoy the Art Walk together, including Palms Garden Square, Caroline’s Chocolate Haven, Remax, Blue Olive, Flava, Sotheby’s, Kaaimans Restaurant and Green Shed, with live music at some of these settings. Art Walk maps will be made available to those attending, also listing activities – these maps will be distributed in the weeks leading up to the Wilderness Art Festival, and are sponsored by Kaaimans restaurant and Beejuice Restaurant. The main venue hosting the Wilderness Art Festival of 2019 is The Wilderness Hotel, with its picturesque surroundings of ocean and mountains creating a superb backdrop – here, those attending can shop for handmade crafts, enjoy live music and a fascinating Art Fair, indulge at the food and drink stalls and also take the opportunity to socialize with likeminded individuals from around the Garden Route or further out. For aspiring artists, the common area in front of The Wilderness Hotel is the place to be, and will be hosting creative activities that can be enjoyed by everyone, including a Chalk Art Workshop, pebble painting, abstract demos and even fabric painting for kids. Remarkably, admission to the art festival, workshops and demos are free, allowing everyone to participate. Find holiday accommodation in Wilderness that will place you and your loved ones close to the Wilderness Art Festival for this year’s exciting festivities. Hello Garden Route offers an array of accommodation options for those visiting Wilderness and discovering more of the Garden Route. We can also assist with arranging car rental and tours & transfers. While enjoying this spectacular destination for your summer holiday, try out some unique adventure activities in the Garden Route, experience an unforgettable Garden Route Safari Tour or try your hand at Golfing in the Garden Route.